BGL Basics: How Do I Add Deer Sightings? 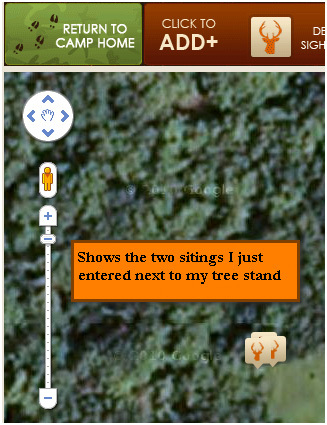 Now we get to the fun stuff, adding deer sightings to the map to store in your outdoor database. Let’s say you went hunting this morning and you had seen deer at 6:00 AM, 7:30 AM and 11:00 AM. You would treat each of these as separate sightings and add them to your map as such. To add a sighting, simply click on your “Add More Items” button on the top of your map. Click on the “Deer Sighting” icon and find the location where you had seen the deer. Again, zoom in as far as you can for the best accuracy. Once you have found the location, click the mouse and follow the instructions. No picture: This option would be used if you were hunting or just walking through the woods. Simply fill out the Date and Time and click next. The weather data will automatically update based on your time and date. This is done by linking up your location and other information. This is used for current and past weather. NOTE: Rut Phase is the only item on the screen that is subjective. We defaulted based on month but I would suggest you change to what you think fits best. All other data should be accurate but can be changed if you disagree. Click next to mark what type of deer you saw. Put the quantity in the fields next to the type. If you select a notable game, the number will automatically increase. If you don’t have a notable and would like to add one, click the link and follow the instructions for adding notables. Click Save and your data has been stored and you can add for your other sightings. NOTE: Treat each sighting as an individual sighting. Do Not try to group each sighting for a hunt as one as it will not give you accurate data.